At that stage, the teenager had failed most of his exams, and watched as his father’s grocery business ran into financial trouble. As a result, the family had to give up the shop and downsize into a two-up two-down mid terraced house with no inside toilet, and Chaudry remembers: “It was all a bit of a shock to the system. “Dad got a job at GKN, in the wheel shop, and my elder brother also worked there as a forklift driver. They got me an industrial cleaning job there, and that summer I worked pretty much full time in the wheel shop, and I saw for myself the sort of heavy labour. And have a go is what he did. After retaking his exams, he eventually got the offer of a sports degree at Staffordshire University, which set him on his way. “Moving away from home, I grew up very quickly, both emotionally and academically,” he recalls. “Mixing with different people gave me the chance to grow up and assess what I was all about. I needed those three years to grow emotionally. In 1983, Mo met Ann, the woman who was to become his wife, when he was living in a £10-a-week bedsit, struggling to find enough 50p pieces to keep the electric meter running. They have been happily married since 1987. By the age of 30, Chaudry had indeed made his first million as a financial adviser and property investor, and has since expanded into the health and fitness, leisure and tourism sectors. He’s also the mentor and manager of the 2017 World’s Strongest Man, Eddie Hall. In fact, he was the man who sponsored him to become full time, allowing him to focus on achieving his ambitions. At the age of 58, Chaudry is now one of the richest and best-known Asian businessmen in the UK, with an estimated fortune of around £100 million. But he’s by no means done yet, and Birmingham is playing a key part in the next chapter of his plans. Mo bought his flagship Waterworld complex in Stoke on Trent from The Rank Group in 1999, and has turned the loss-making operation into a thriving and profitable business which now attracts some 400,000 visitors a year. With further expansion currently under way, that figure is expected to rise to 750,000. He also now owns and operates the highly successful M Club Spa & Fitness Clubs in Staffordshire, and has significant property interests via investment firm M.I.C Investment Group. But that’s not all. Over the past few months Mo has taken a majority stake in fitness company Pulse Group, which provides business support solutions to more than 100 UK clubs and operates 15 fitness, leisure and soccer centres. Mo wants to double the size of this business in the next five years, and has some exciting plans to raise the profile of his latest brand across the Indian subcontinent. He describes it as a ‘sleeping giant’ of a business which, with his injection of fresh cash, is waking up fast. Closer to home, it was this time last year that Chaudry bought the Adventure Island Mini Golf at Star City from founder John Whitehead for an undisclosed sum, announcing ambitious plans to expand the brand and concept across the country. Founded a decade ago, it has two themed 18-hole crazy golf courses containing tiki huts, waterfalls and volcanoes, spread across three tiers of the Star City complex. Mo plans to plough £20 million into launching 20 new centres across the UK, in key towns and cities – once he’s got his new Pulse Group infrastructure up and running first. He’s eager to launch a second Adventure Golf site in Birmingham, but admits that two potential land deals have fallen through in the past year. “Birmingham is an area I’m very interested in, not just with Adventure Golf but also with our Pulse Gyms brand too. With everything going on in the city right now, it’s a huge market for good quality independent operators. All this entrepreneurial expansion is a far cry from the day, in the early 1970s, when a young Mo first arrived in the UK – unable to speak a word of English - with his parents, and three siblings, looking to make a life for themselves. “When we moved to the UK from Pakistan, we originally set up home in Luton, but my father had the opportunity to buy into a business, so we packed up and headed to the West Midlands. “My parents were stereotypical immigrants, energetic and ambitious, wanting to prove themselves and make a good life for themselves and their family. “We set up what seemed to be a very successful family business, Iqbal and Sons, and we lived above the grocery shop. It was a real family affair, with mum making the samosas and me and my brothers working there too. “I was naturally good with numbers, so even though I wasn’t the oldest child, I was first in the pecking order when it came to running the tills. On his schooling at that time, he recalls: “When I was at grammar school, I was deluded. I thought I was cleverer than I was, and didn’t do well because I didn’t knuckle down like I should have done. Chaudry credits that time he spent doing a different kind of maths – totting up prices behind the till at the family business - for teaching him one of his most important lessons. “Everything we do is about people. If you can connect with people, it will set you in good stead for business, and life. Dealing with different people in the shop at the age of just 13 or 14 gave me a very early opportunity to discover customer relations. I managed to develop that skill-set, and it set me up for life. 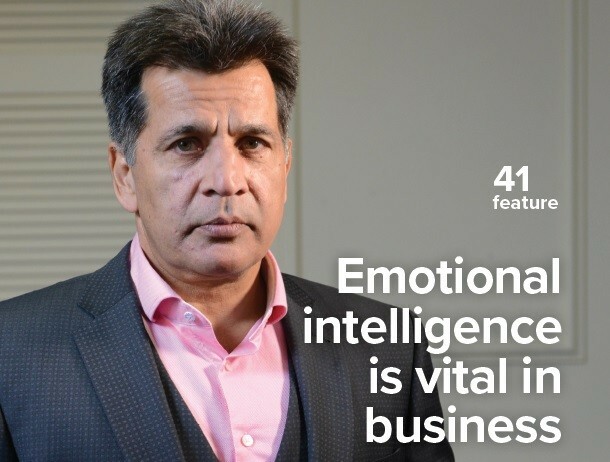 “Emotional intelligence is essential in business. My generation had it, this generation doesn’t, so if you do find a young person that does have it, they are a gold nugget. Sport has always been a big part of Chaudry’s life. He had trials with first-class cricket county Warwickshire, and you sense it’s a source of frustration that he never quite made it at the very top level at Edgbaston – after all, he’s not accustomed to failure. He appeared on Channel Four’s intriguing Secret Millionaire series some years ago, where rich business people went under cover, living on benefits, in the hope of finding people deserving of their help. Chaudry ended up handing out £30,000 to causes in Leeds which just needed a lucky break – and despite the meagre allowance he was given to live on during the experiment, he still managed to save a few pennies. A sign of that shrewd business sense coming through again. “We are all human; we learn from our mistakes and experiences, and sometimes just need a chance,” he says. “I’m absolutely loving what I do right now. What keeps driving me forward? The satisfaction of creating, achieving, and sharing with others. “I have at least 500 people whose jobs depend upon me now, and have plans to double that number. It’s pleasing to see other people now benefiting from my endeavours.